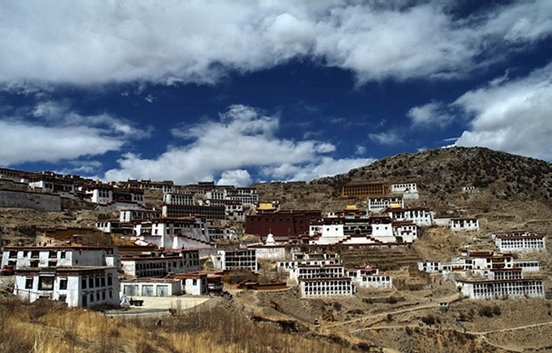 Ganden Monastery (噶丹寺), also known as Gaden Monastery, is one of the 'great three' Gelukpa university monasteries of Tibet, together with the Sera Monastery and the Drepung Monastery. Located at the top of Wangbur Mountain, Tagtse County, Tibet Autonomous Region, Ganden Monastery was built in the 7th year of the Yongle Reign (1409) during the Ming Dynasty (1368-1644). Ganden Monastery consists of over 50 structures and main halls include the Main Assembly Hall (or Coqen Hall), Zhacangs, Khangtsens, and Myicuns. Coqen Hall is positioned in the northern part of the temple and faces south, which is the largest assembling hall. It has three storeys and is 43.8 meters wide and 44.7 meters long. It features the statues of the Maitreya Buddha and the master Tsong Khapa, the initiator of Gelugpa. In addition, it also has many rare and precious cultural relics, such as Qing Dynasty armor. - Hours: 9 a.m. - 4 p.m.
- How to get there: take bus at the square of Dazhao Temple. Bus leaves at 7 a.m. and a roundtrip ticket is 20 yuan.